Naval Support Activity Bahrain (NSA Bahrain) is a United States Navy base, located in the Kingdom of Bahrain and is home to U.S. Naval Forces Central Command and United States Fifth Fleet. It is the primary base in the region for the naval and marine activities. A former military installation of the Royal Navy, command changed hands to the U.S. government in the early 70's. Deliver effective and efficient readiness from the shore. Be the sole provider of shore capability, to sustain the Fleet, enable the Fighter, and support the Family. The mission of NSA Bahrain is to support Commander, US Fifth Fleet, deployed assets, military and DOD civilian personnel assigned to Bahrain. NSA Bahrain Operations Department oversees the daily activities of all ships and aircraft on board the installation. Operations Department supports the U.S., and Coalition homeported ships as well as visiting ships. The department also provides air support to Operation NEW DAWN and transports incoming, outgoing, and transiting personnel and cargo to 20 remote airfields throughout the CENTCOM area of responsibility. Naval Support Activity (NSA) Bahrain is located in the Kingdom of Bahrain in the center of the Middle East on an island in the Persian Gulf, east of Saudi Arabia. Its strategic importance cannot be underestimated as it is literally in the center of the Middle East. The United Kingdom is also working to en­sure the stability and secu­rity in the Gulf. Longtime allies UK and Bahrain endeavor to build a new British naval base to ad­dress security challenges in the re­gion. Adult family members of DOD personnel permanently assigned to Bahrain are authorized to accompany their spouse. NSA Bahrain population consists of approximately 8,300 military personnel, DOD Civilian employees and their families, assigned to NSA Bahrain and 93 tenant commands, as well as Joint and Coalition Forces. Upon arrival, you must go immediately to the Temporary Quarters (TQ) office to get your orders stamped with the arrival date. If you have advised your sponsor in advance that you are bringing a pet, you will stay at one of three hotels that allow pets. There is no extra cost for pets. Temporary lodging will be in a local hotel for most personnel for up to 45 days with non-availability statement from TQ. Your sponsor will make your TLA reservation and/or arrangements through TQ office. If Permanent Change of Station (PSC) to NSA, Bahrain you will be assigned temporary lodging for up to 45 days, once you arrive and receive Temporary Lodging Allowance, which you must apply for every ten days until housed. Detailed brief and/or complete explanation will be given when you attend the housing brief upon arrival. Dependents are allowed to accompany permanently assigned military members as of 2010. Contact the Navy Housing Welcome Center (Building 263) for more information. Call commercial from the states to Bahrain: prefix: 011-973 phone number: 1785-4983 or DSN (318) 439-4104. Living in Bachelor Housing is mandatory for all E-3 and below military, unaccompanied service members assigned to NSA, Bahrain and all of its tenant commands. Overseas Housing Allowance for Bahrain is sufficient to cover the cost of rent and utilities to house all military personnel adequately. Department of Defense civilians receive TQSA that plays the same rules. Your allowance is determined by your pay grade. All civilians and E-4 and above are allowed to live off base and receive this allowance. 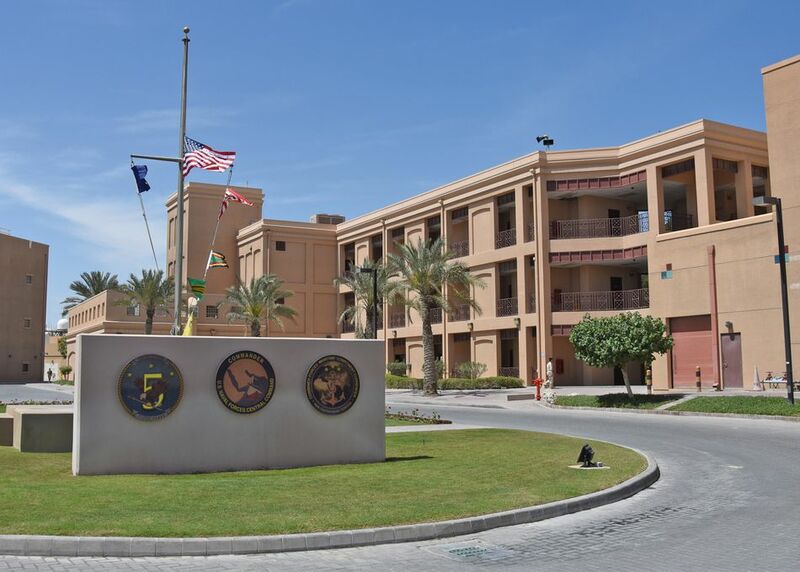 The Department of Defense Dependents School in Bahrain is located on a 26-acre campus in Juffair near NSA. Bahrain International School Association operates a dormitory adjacent to the school which serves approximately 120 students from grades 9 to 12. The Elementary level follows the American curriculum from Kindergarten through Grade Five. The Middle level comprises American grades six, seven and eight. The Secondary level offers both the American Curriculum and the International Baccalaureate programs. The American Curriculum is a flexible combination of required courses and electives, each offering one academic credit for each successfully completed school year. The International Baccalaureate program allows students who have successfully completed Grade Ten to pursue a two-year advanced study leading to the award of the IB Diploma. Special services include Arabic studies, counseling, English as a second language, special education, language arts/reading improvement, compensatory education and enrichment activities. College examinations are also offered to our students. We offer SAT, ACT, and other entrance examinations. We also have a system-wide testing program, CTBS, which is administered to students in grades 3 to 11. The school offers a wide variety of curriculum extensions through after-school activities as well as an extensive sports program for all students. The school does have a conservative dress code in line with local customs that depends on the age of the children. The Child Development Center and the Youth Teen Center provides full-time and hourly care based on space and availability. Groups focused on relative ages and abilities will be created to ensure proper supervision and care of young children. The School Age Care program is designed to enhance the school day by providing before and after-school care, summer camp, and hourly care. Naval Base Bahrain Medical Clinic is responsible for providing care to Naval Support Activity Bahrain, U.S. Naval Forces Central Command, Commander Fifth Fleet, and 91 tenant commands. We also provide primary care delivery to more than 3,800 beneficiaries ashore and provide medical support to more than 12,000 fleet Sailor, Marines, and other DoD personnel operating in the Central Command theatre. Prescriptions for chronic conditions or special order medications should be filled via the TRICARE mail order pharmacy (TMOP) program. Dental services offered include routine preventive and restorative care including root canals, minor surgery, and limited prosthetics. Active duty service members have priority treatment. Access to the dental clinic is limited to urgent/emergent care for family members and retirees.